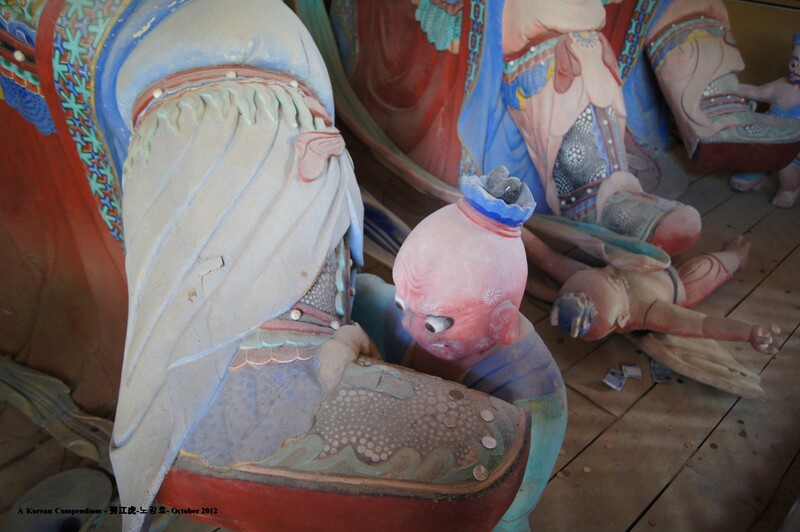 The end of September saw the celebration of one of the most important events in the lunar calendar, namely Ch’u-seok. 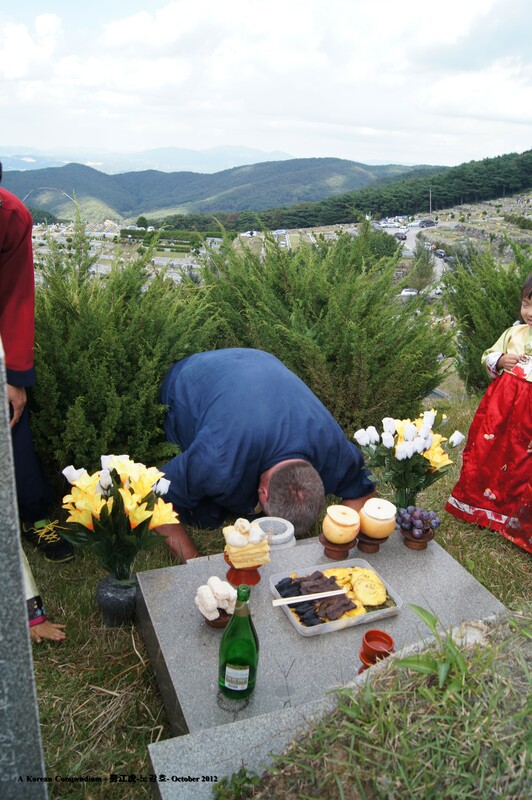 This important celebration sees families gathering to worship their ancestral spirits and celebrate the harvest. 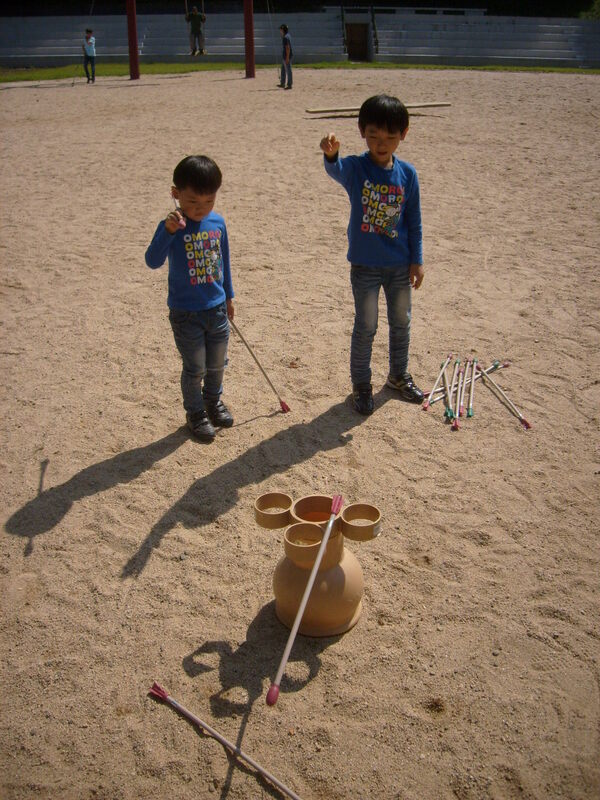 The event is marked by a public holiday during which traditional games are played and foods such as song-pyeon (송편) and rice wine eaten. 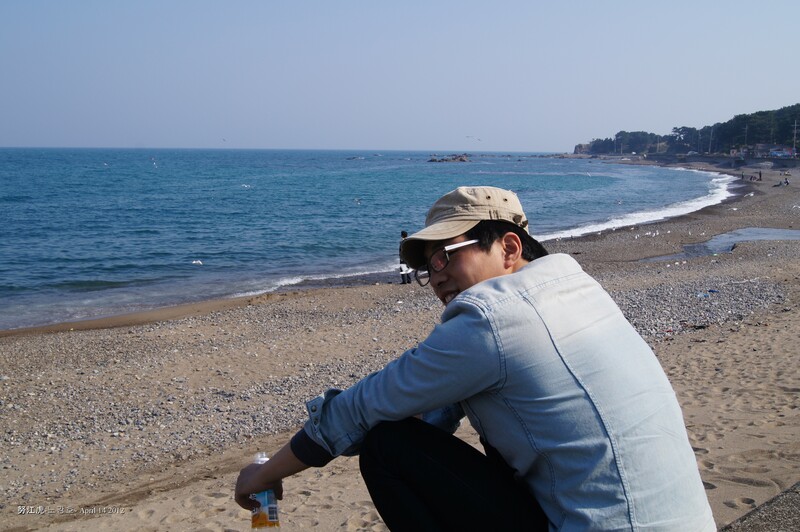 This Ch’u-seok, I travelled with my komdo teacher, Kwon Yong-guk and his family to a rural town near Ulsan. 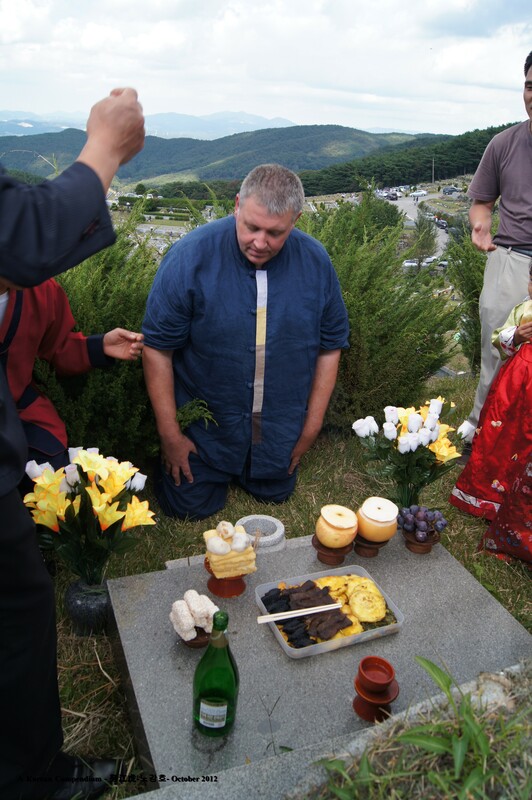 As well as paying respects to his relatives and ancestors, we planned to do some bamboo cutting (Bamboo Cutting in Ulsan). 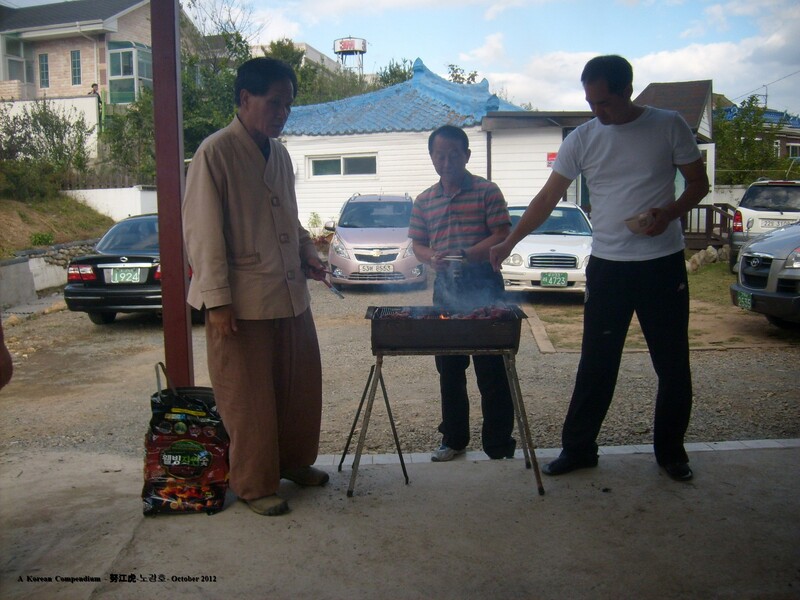 Kwon Yong-guk’s father in law, who used to be Chief of the Fire-brigade in Ulsan, has two houses side by side in a small plot surrounded by farm land. 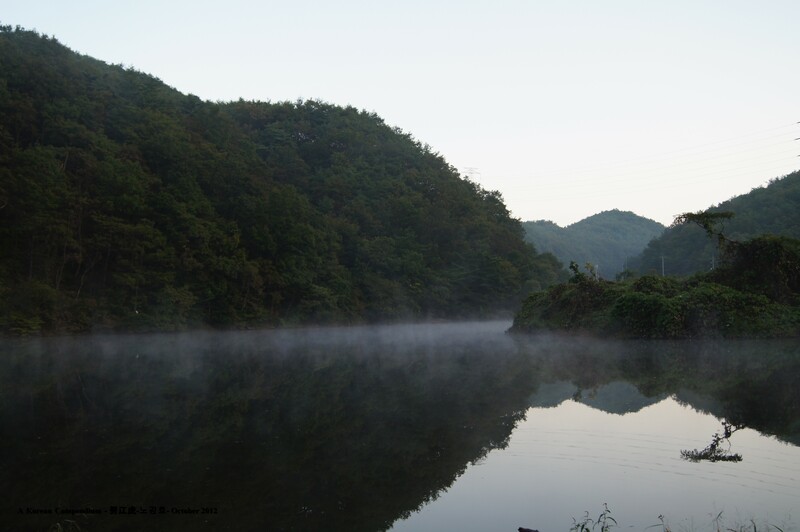 The setting was quite beautiful especially as it was autumn and the chillies and persimmon, such iconic sights in Korea, were ripe. 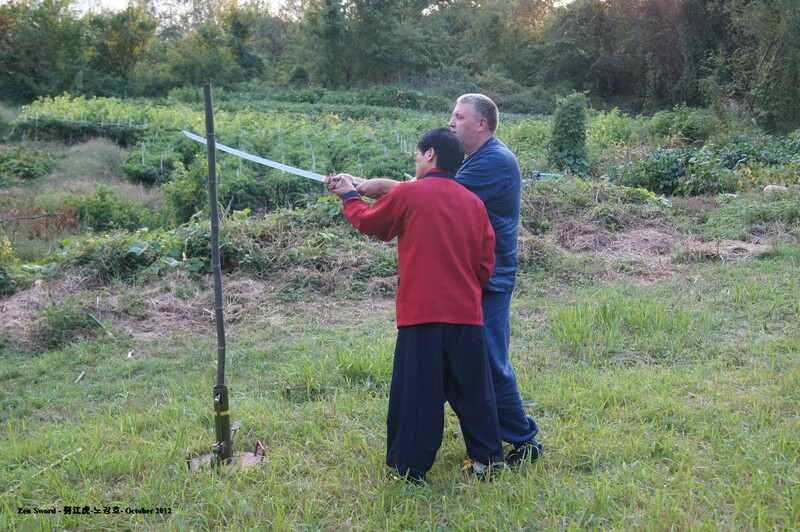 We spent half an hour trying to net the super soft type of persimmon, known as hong-shi (홍시), with a long pole and attached net. 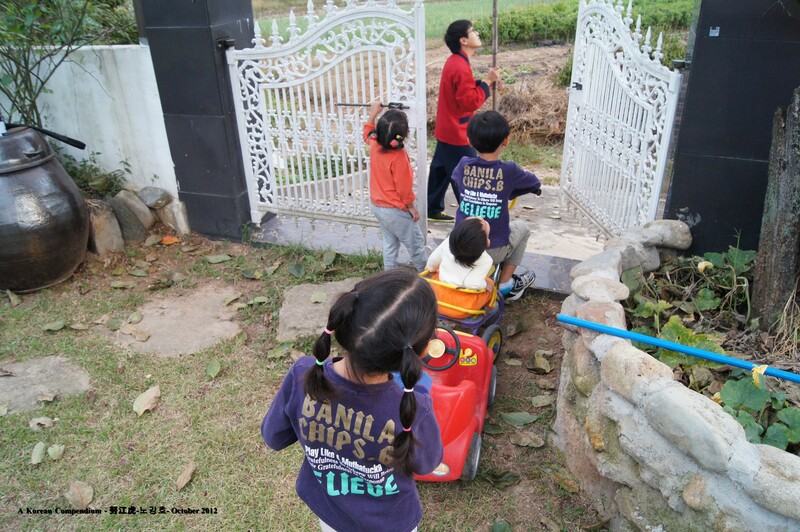 Some of the kids playing under a persimmon tree. 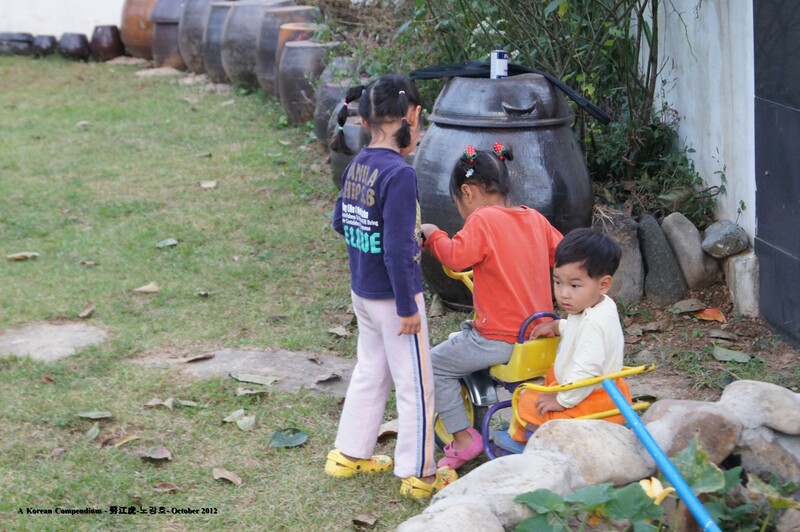 The back garden was ringed with kimchi pots. 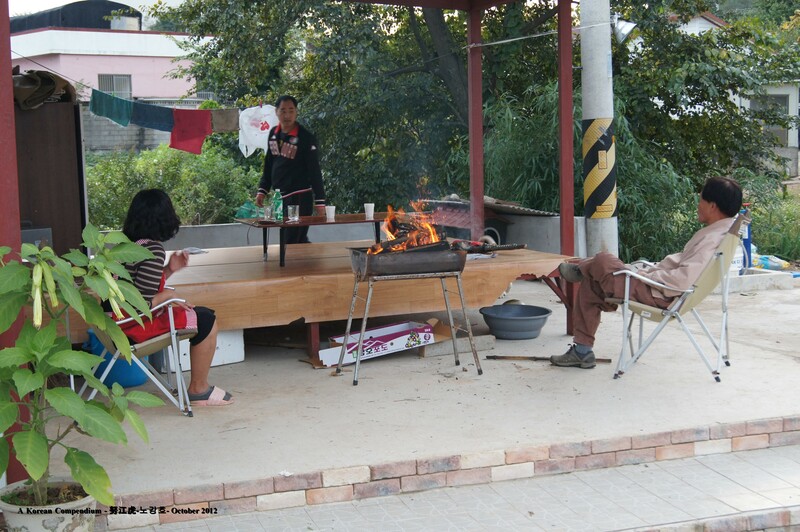 After cutting bamboo in the afternoon, we gathered in the courtyard of the house and cooked a barbecue. 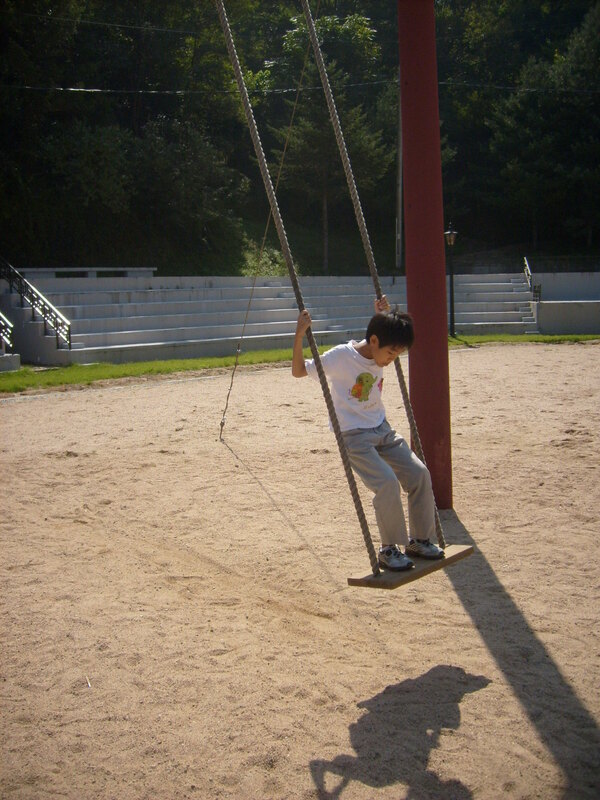 Kwon Yong-guk has a huge family with about 80 members from both sides. Many of them I was to meet the following day. 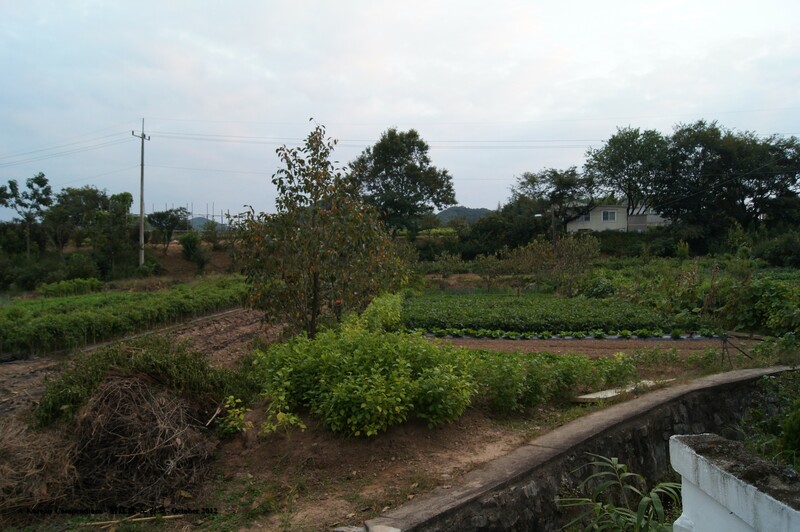 Darkness fell and in the countryside, unlike Daegu, one is treated to real darkness and a good view of the stars. And when some clouds cleared and the full moon was visible, the children made wishes. 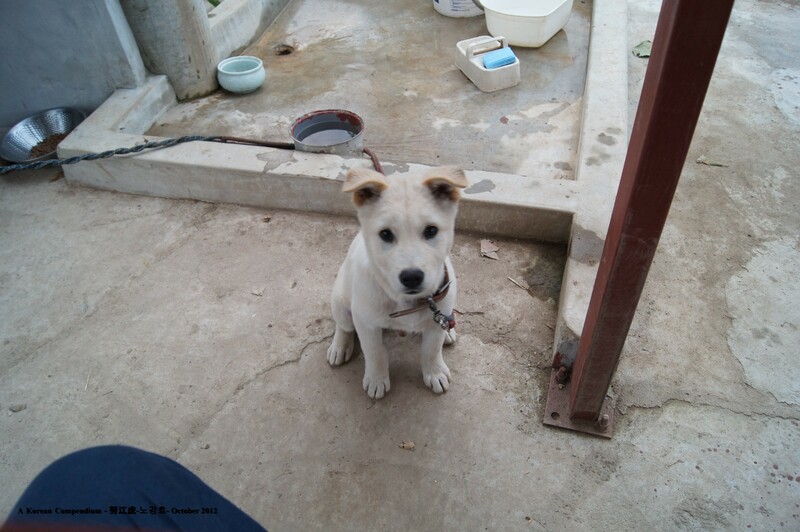 Sleeping wasn’t particularly comfortable as I was on the floor in a shared room and just as I started to get some sleep, at around 4am, Kwon Yong-guk’s alarm went off. 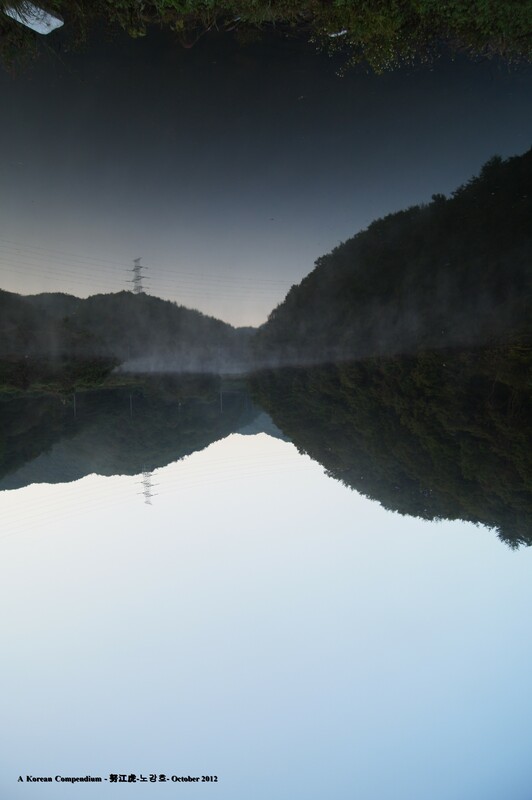 Next, we were going fishing. Not being enamoured with sitting watching the floats for hours on end, I found a small patch of flat ground and did some training. 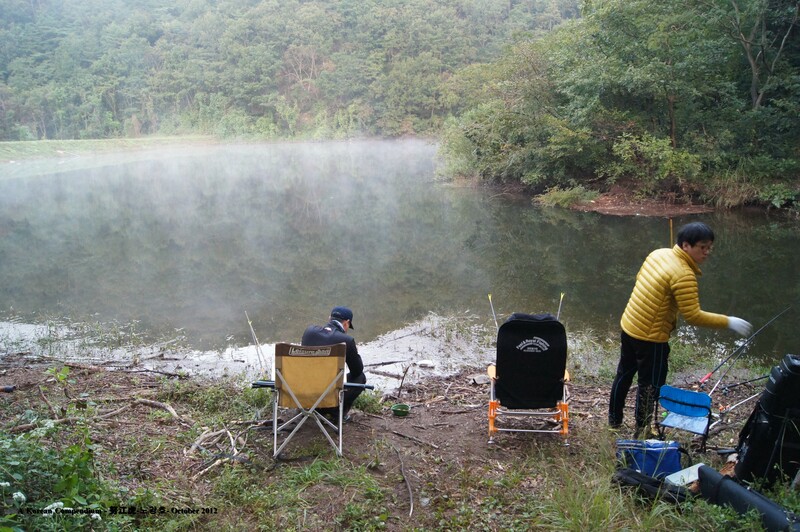 Kwon Yong-guk caught two small fish. He never eats them and throws them back in the water. 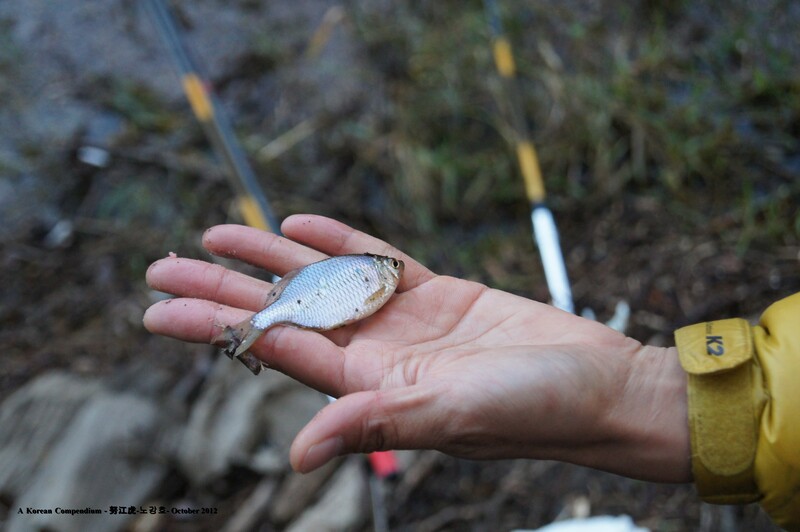 When he excitedly showed me his first catch I told him I needed to get my glasses but I don’t think he got the joke! 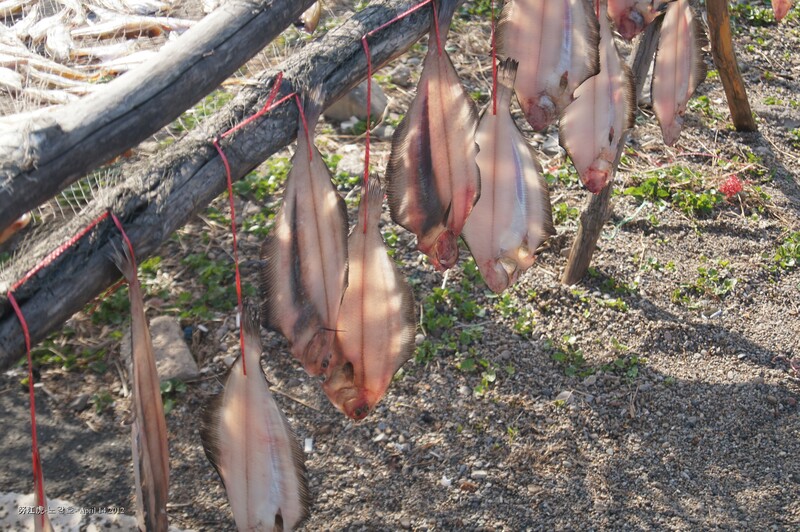 After fishing we travelled back to the edge of Ulsan to have breakfast. 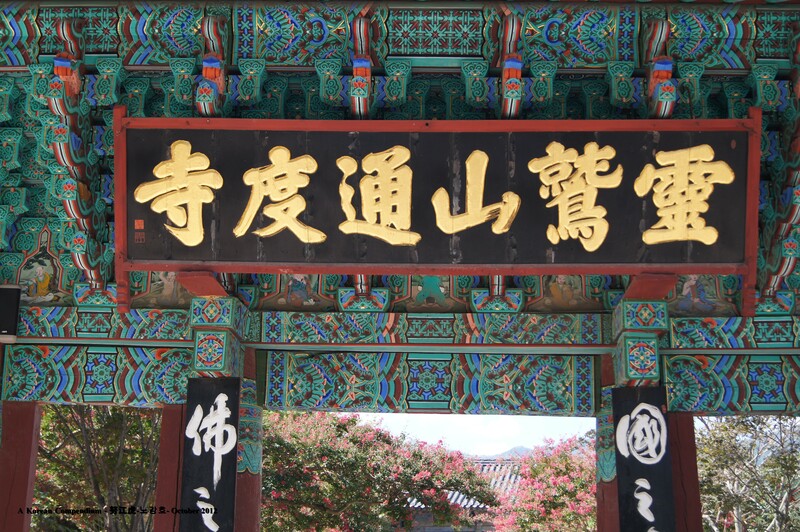 Next, was a visit to one of Korea’s most beautiful temples, Tongdosa (통도사). 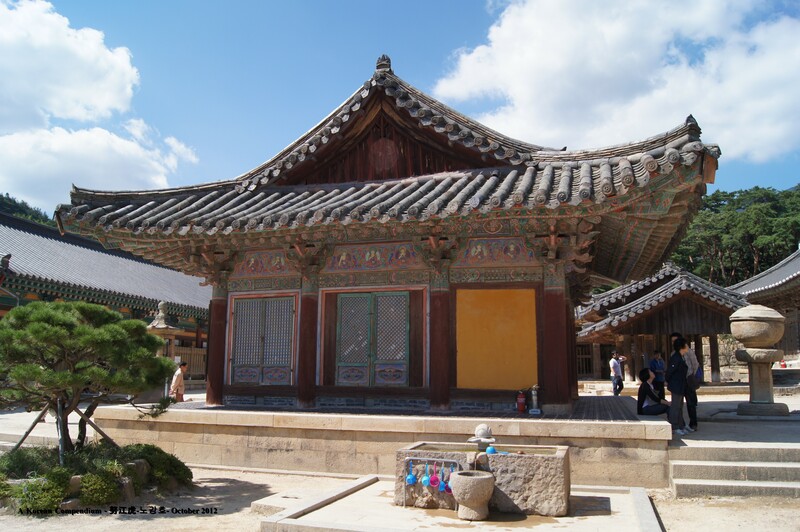 This is Korea’s largest temple and is famous, among other things, for having no statue of the Buddha outside the temple and a temple candle which has burnt for 1300 years. 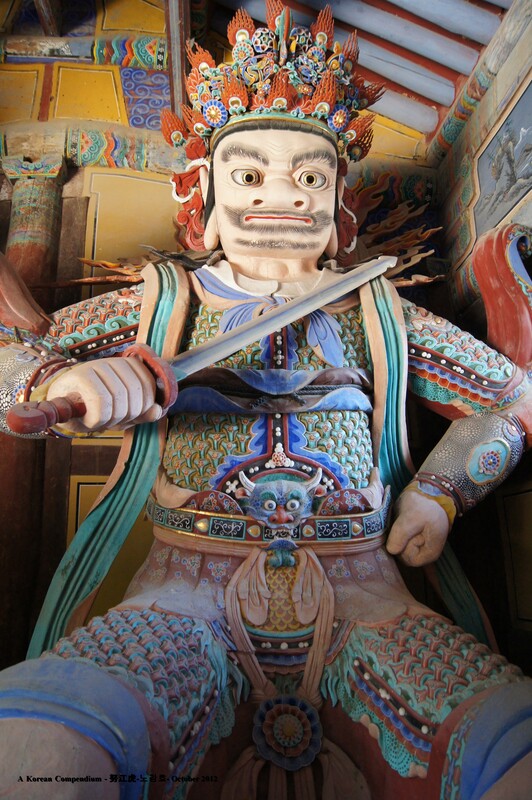 One of the Four Heavenly Kings, Virupaksa, guardian of the West. 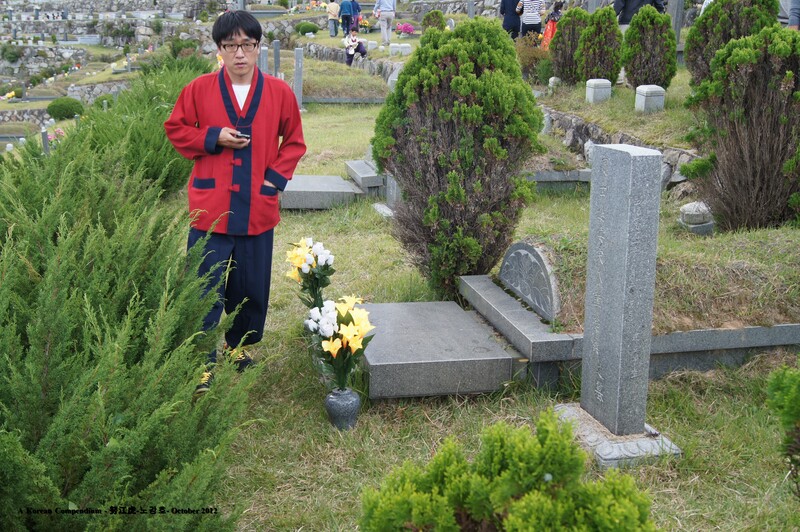 Next, we travelled to a mountain cemetery where Kwon Yong-guk’s in-laws were gathering. 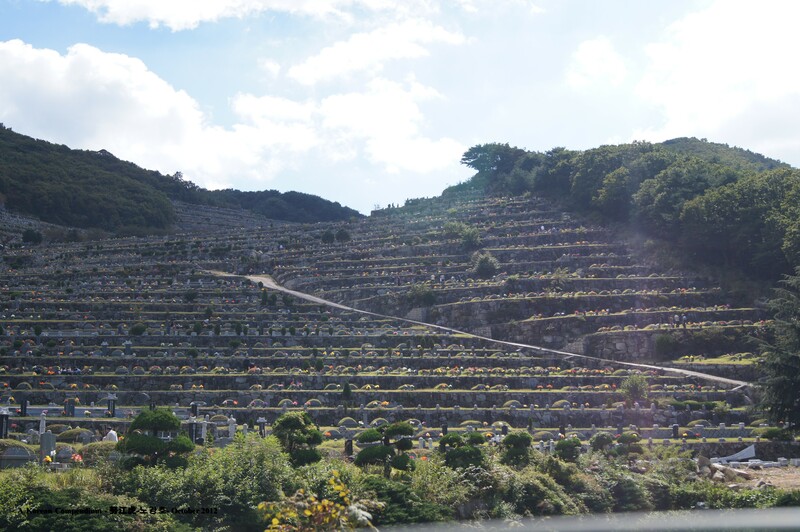 The cemetery spanned the sides of three mountains and was the largest I have ever seen. 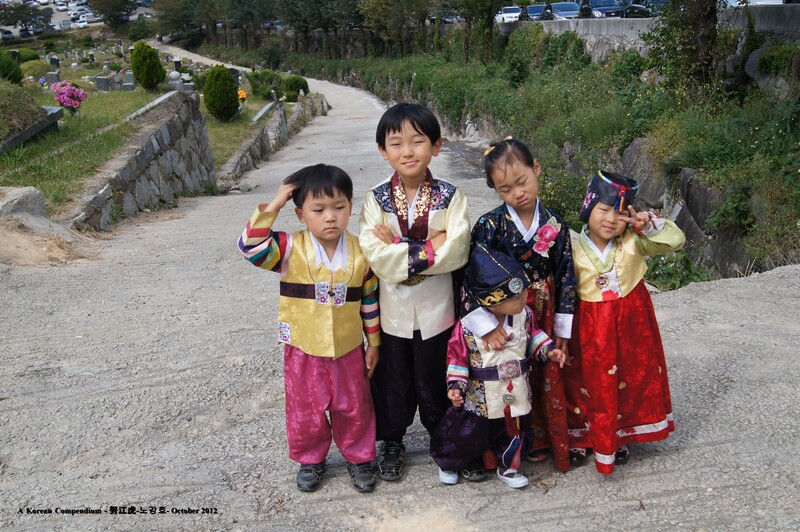 The young kids in Hanbok. Kwon Yong-guk’s sons are far left. 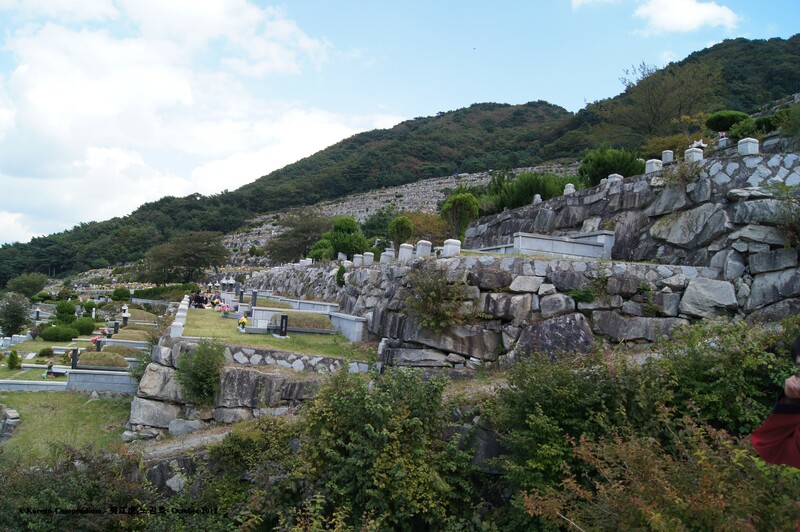 On September 22nd, I travelled to Andong with my komdo teacher’s family, some students and ‘LC.’ I last visited Andong in 2000 and it was a brief visit of only a few hours during which there was no time for sightseeing. First, we visited the longest wooden bridge in Korea which spans the Nakdong River just outside Andong. Incidentally, the Nakdong meanders northwards to pass through Daegu. 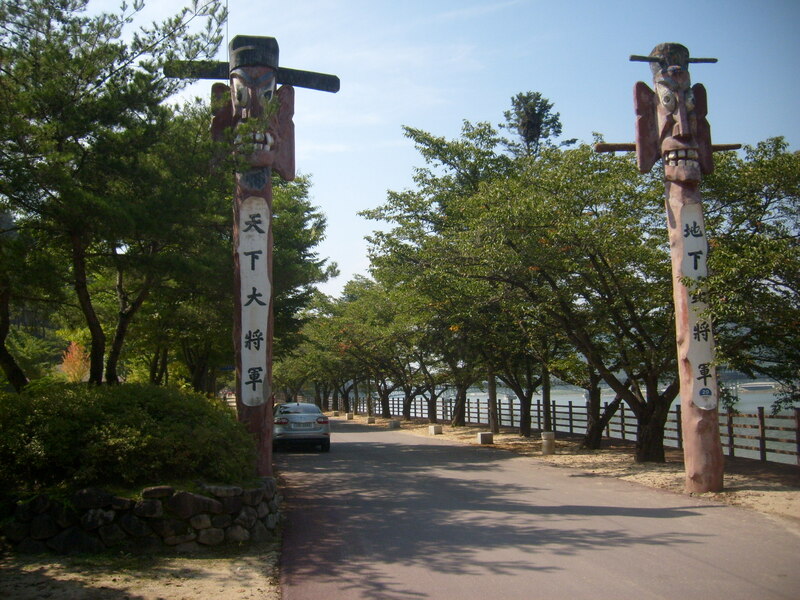 We walked across the bridge and visited a park where traditional games can be played, (these are always popular on holidays) and then visited a nearby cultural museum. We then ate Andong chicken stew in the city. In the afternoon we headed to Hahoe Village. 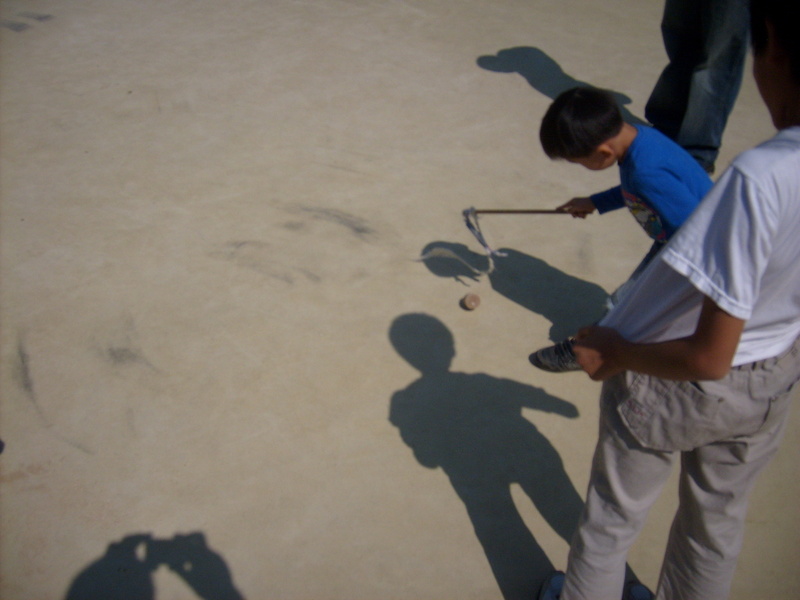 Another traditional game rather like darts but the target is a pot. 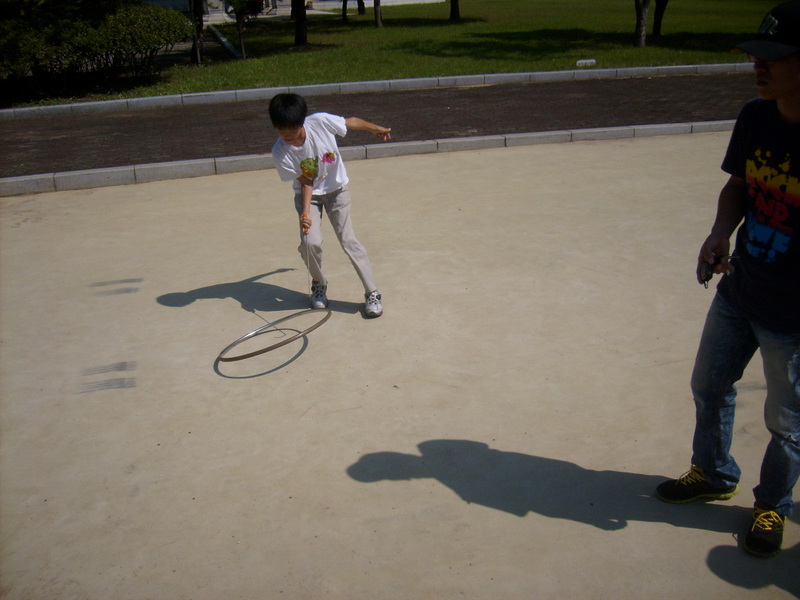 This game consist of a spinning top which is whipped to keep the momentum. 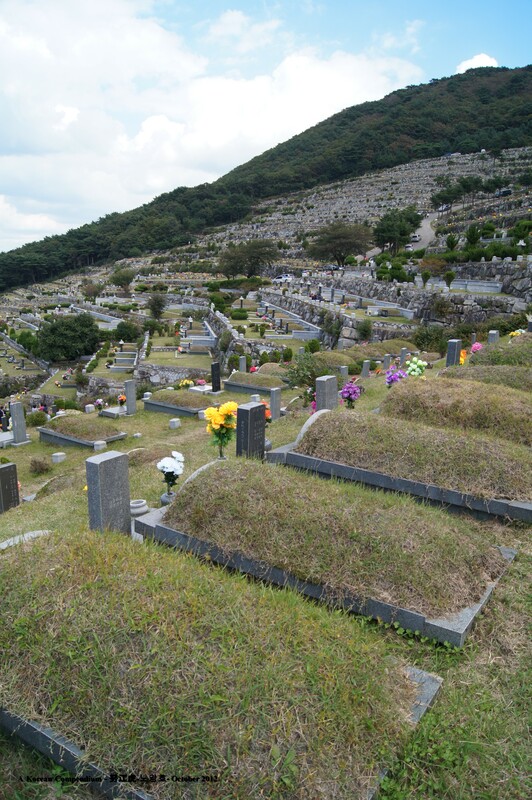 Every Korean town and province is famous for something. 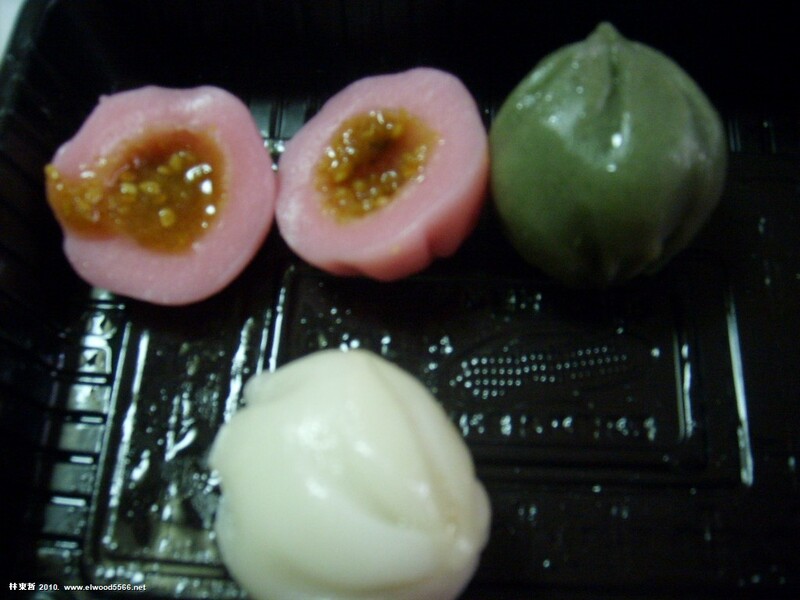 In Ch’eonan it was the walnut cookies while in Daegu it is the apples, textiles and mak ch’ang. 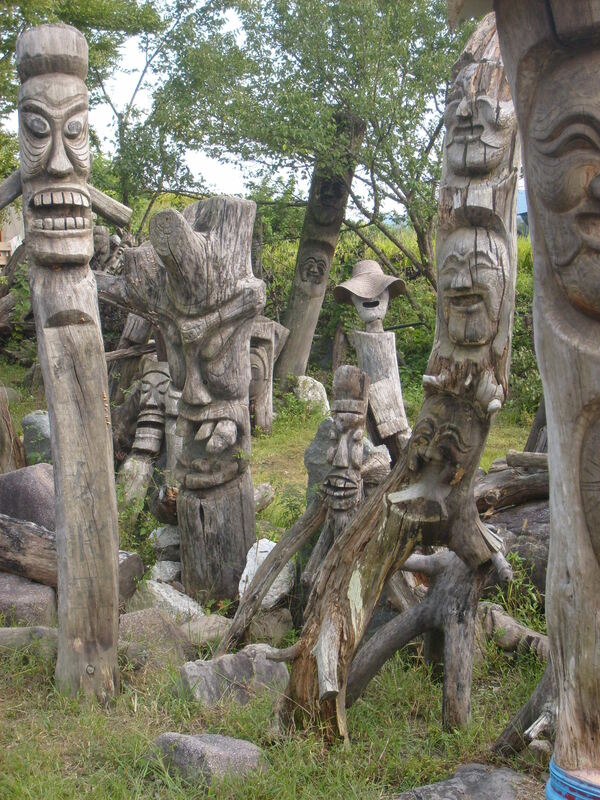 Andong is famous for its spicy chicken stew, mackerel, soju and of course, the mask dance. Back in 2000, I remember several Koreans proudly reminding me that Queen Elizabeth 2nd had watched a mask dance in Andong on her birthday in 1999. Indeed, a small building at the entrance to Hahoe Village houses various artifacts and photos from her visit and in the garden nearby, grows a pine tree she planted. At one time, one of the underpasses in Daegu was painted with a large mural commemorating her visit but I think it has since been painted over. Masks have a long tradition in Korea and were used both by soldiers in war, in burial rituals and in shamanistic ceremonies. 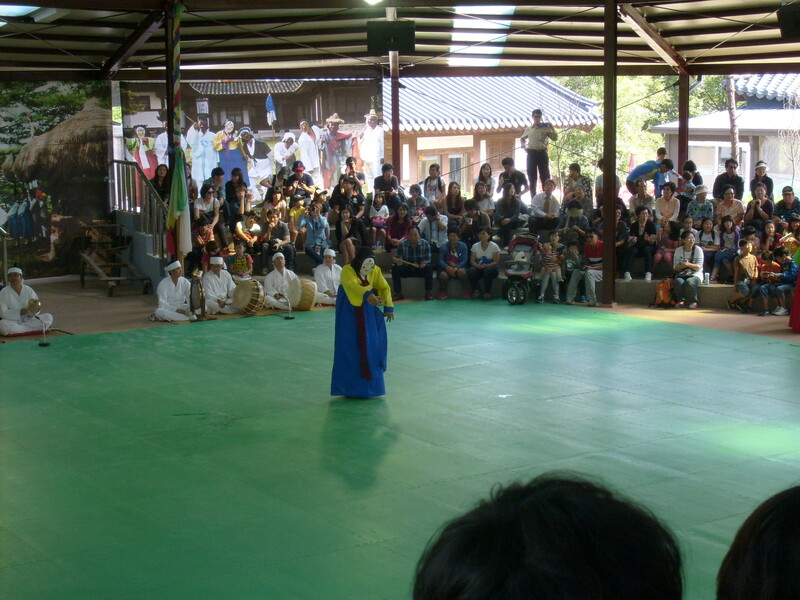 There are several types of mask dance, better described as mask dramas but the Hahoe version is probably the most famous. 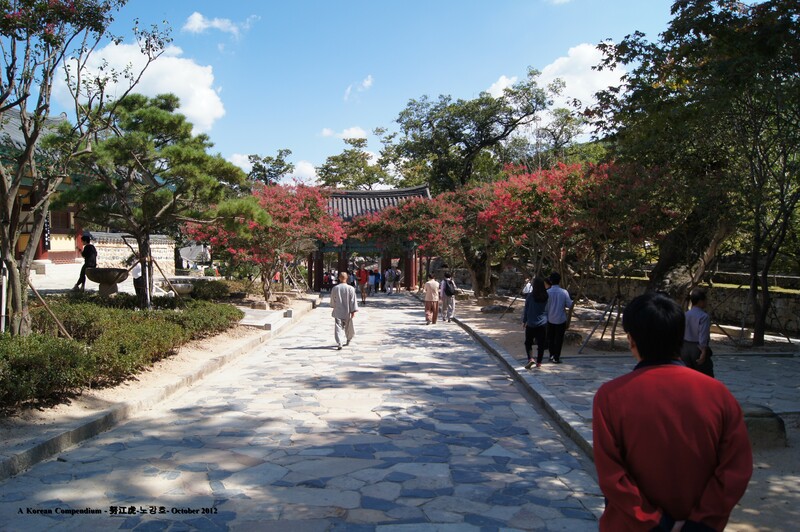 Typically, there are a number of characters including a monk, a scholar, a simpleton and some nobles (yangban). 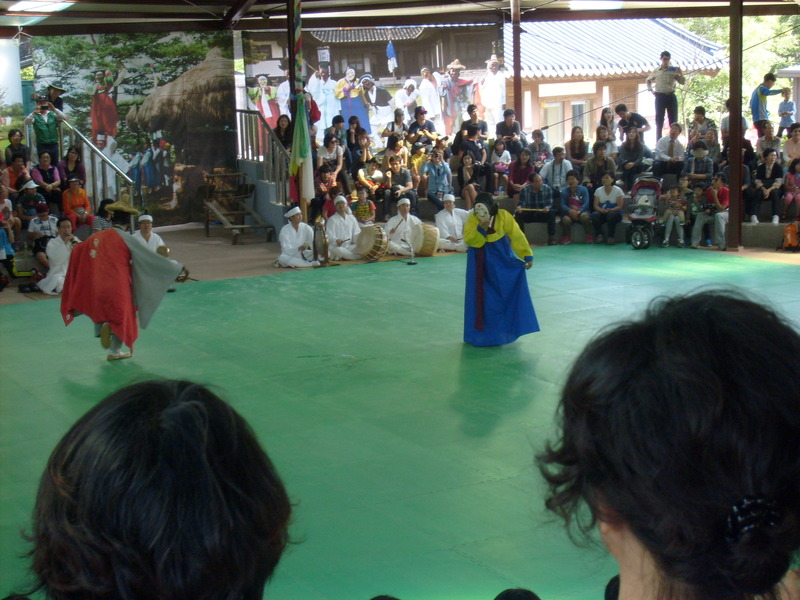 The Hahoe drama is an exorcist play dating back to the Goryeo Dynasty (918-1392). The dance is performed regularly but the actual International Mask Festival is only once a year. I had no idea what the play was actually about but it was amusing and after a short while the masks begin to become quiet realistic. 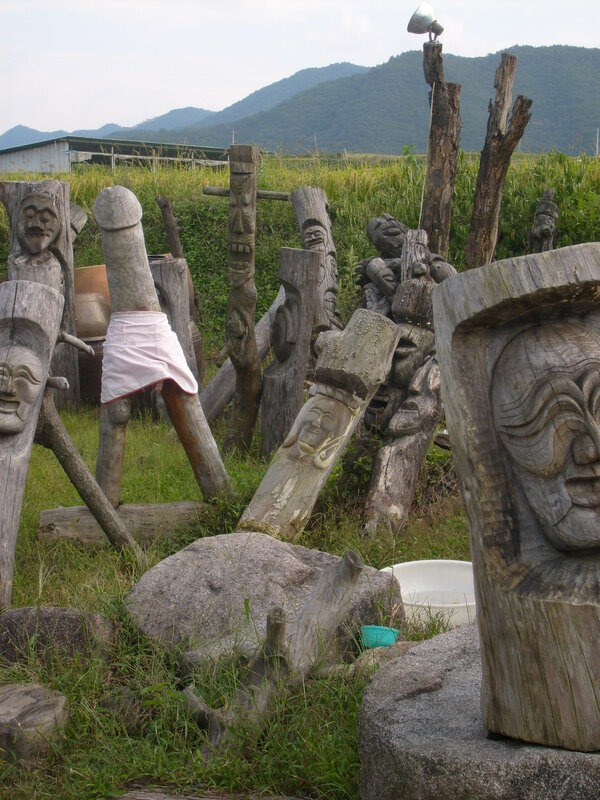 Close to the dance site is the traditional folk village of Hahoe where you can find a museum dedicated both to Korean masks and masks from around the world. 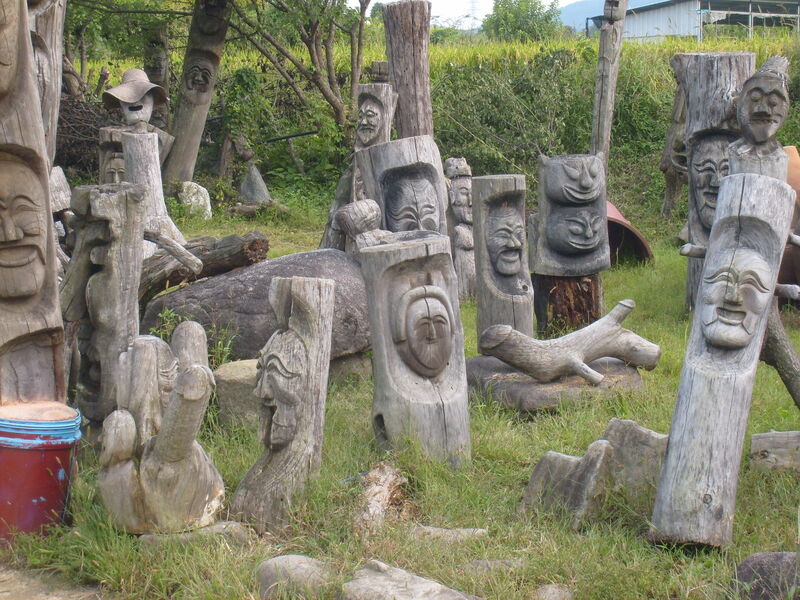 The village is a working one with a small population who are engaged in traditional crafts which you can often watch. 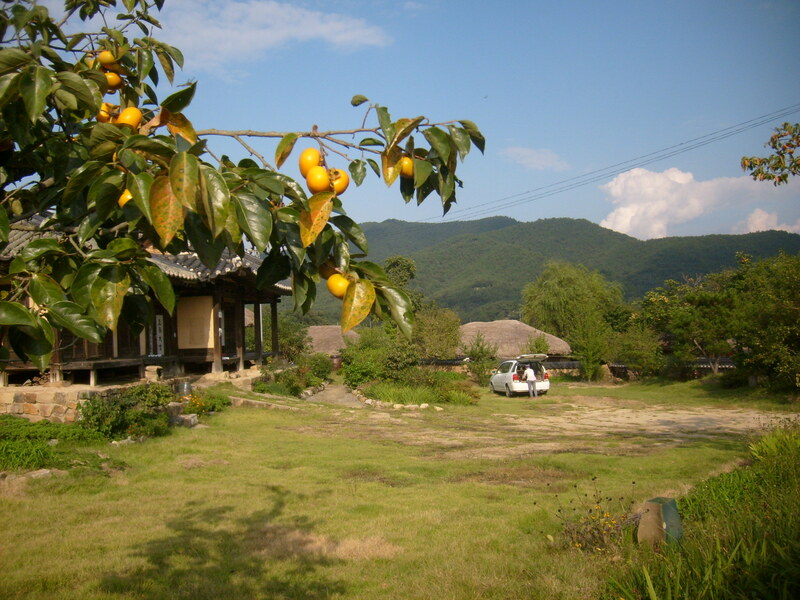 As in other folk villages, there are numerous guest houses, known as minbak, which give a taste of a former lifestyle. 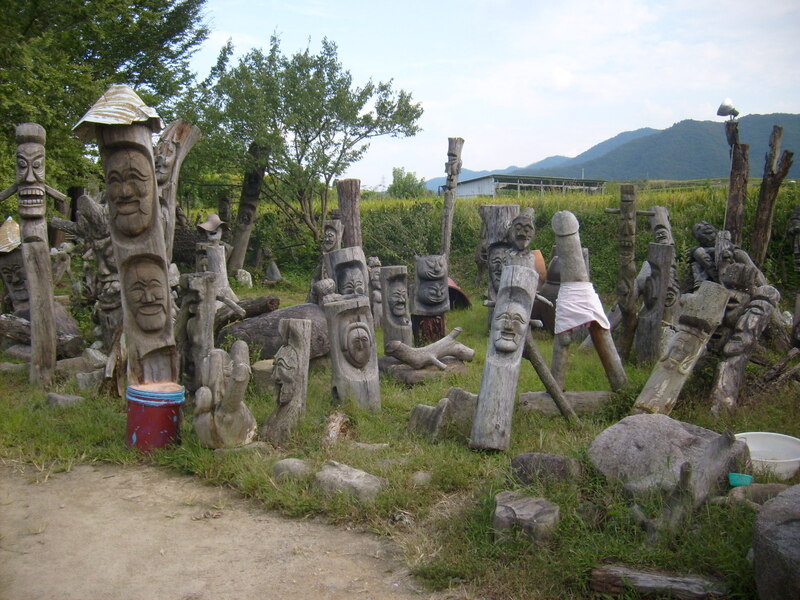 Close to the entrance of the village is a ‘graveyard’ of abandoned totems (장승 – jang-seung). 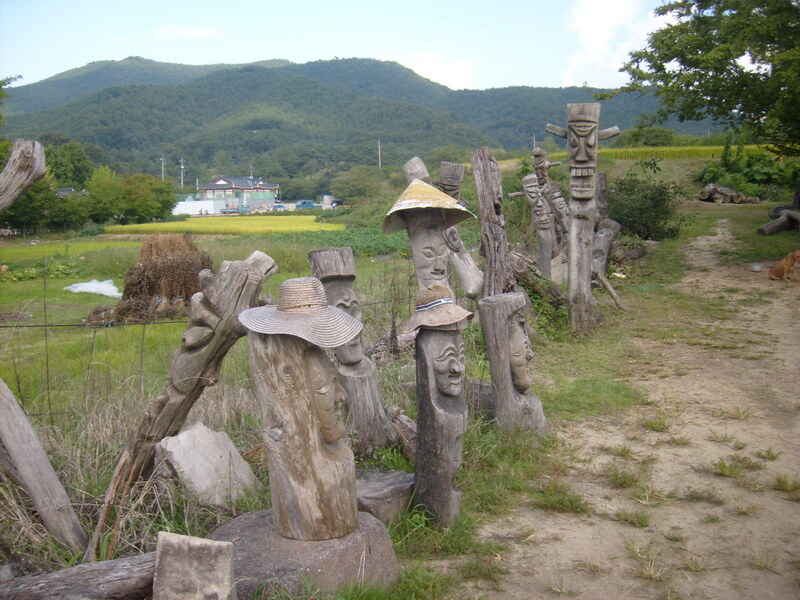 I love Korean totems and wrote about them in: Fascinating Physogs. 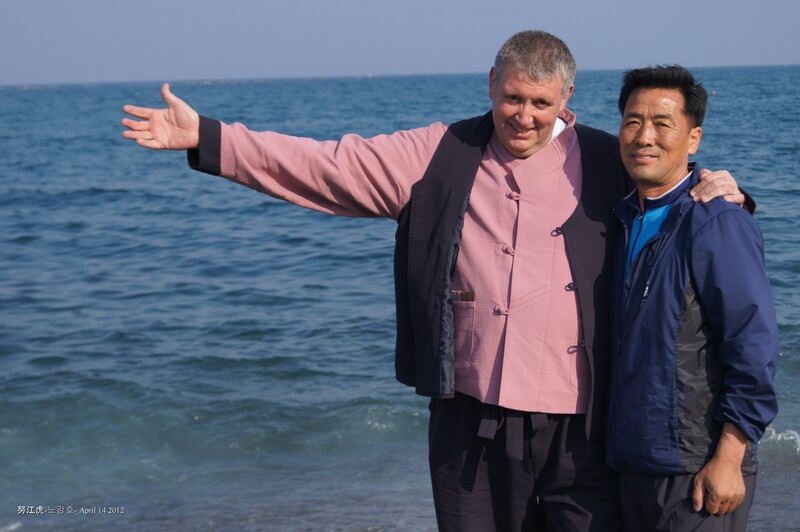 Jan 2012. One last shot from a different angle. 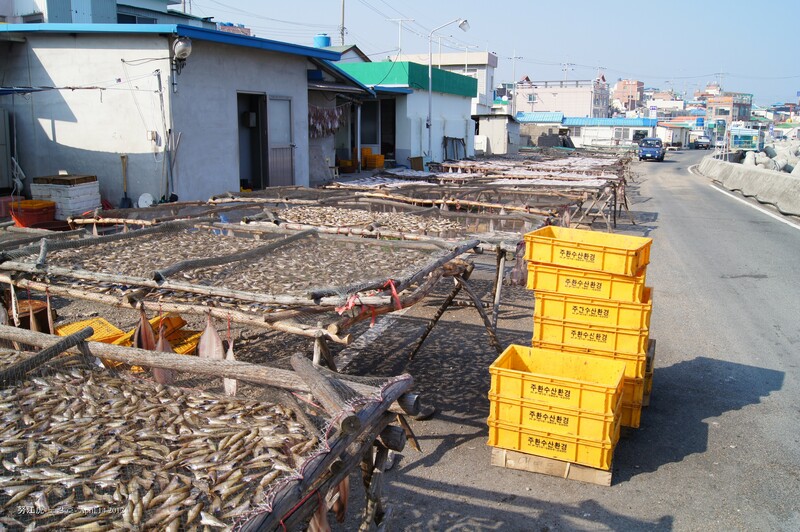 Kam-Po is a small fishing town on the east coast, equidistant between Ulsan and Po-hang. 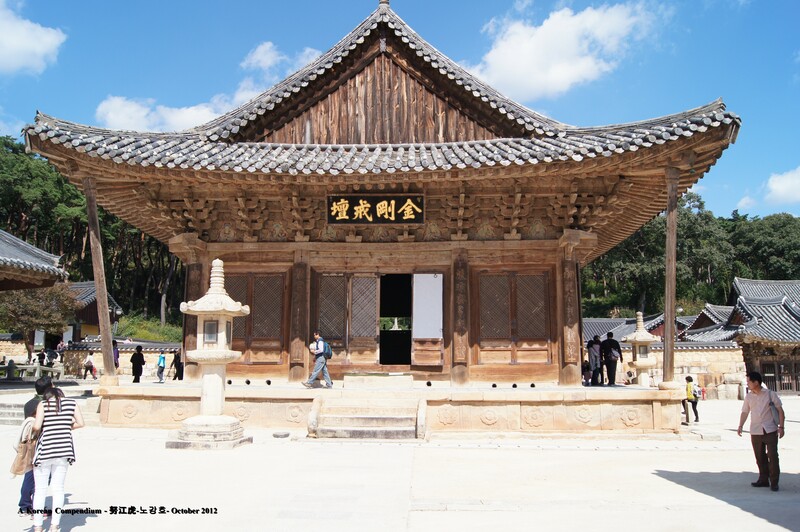 I actually travelled there from Kyong-ju, several weeks ago.